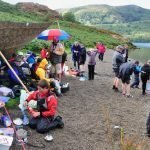 We can now confirm dates for this year’s Family Gathering at Ullswater. They are the 4th to the 10th August. This is slightly earlier than usual, preceding Ullswater Yacht Club’s Family Week so that those who wish to stay on longer can do so. We will be sending out booking forms just as soon as we have amended pricing. As per last year, tents can stay on the UYC site, whilst camper vans will be able to use the facilities at Cross Dormont, over the road from the club with its spectacular views over the lake. To help improve communication this year, we have set up a public Facebook page to keep everyone up to date. Please do follow us and share our page, linked here. The aim of the Gathering is to promote family sailing and get people of all ages onto the water. Sailing with us can be a springboard onto more adventurous sailing in less sheltered water, or simply an opportunity for fellowship in an outstandingly beautiful location with the wind (and perhaps a little rain) in your face. Everything is optional, value for money is exceptional! Please contact Mark and Julie at [[email protected]] for more information and to make your booking. See also our informative Flyer, linked here.